In the mid-50s, the Monster Boom was ignited when the classic horror movies of the previous two decades were packaged and released to the still-new medium of TV. The phenomenon was fueled by local station horror hosts, monster magazines, comic books, bubble gum cards, novelty records and model kits. In 1964, monstermania went mainstream when two monster-inspired sitcoms hit the networks. ABC’s upscale Addams Family brought the witty, perverse panel cartoons of Charles Addams to life, while CBS' The Munsters was more of a traditional, down-to-earth, domestic comedy, with iconic monsters standing in for the usual cast of characters. 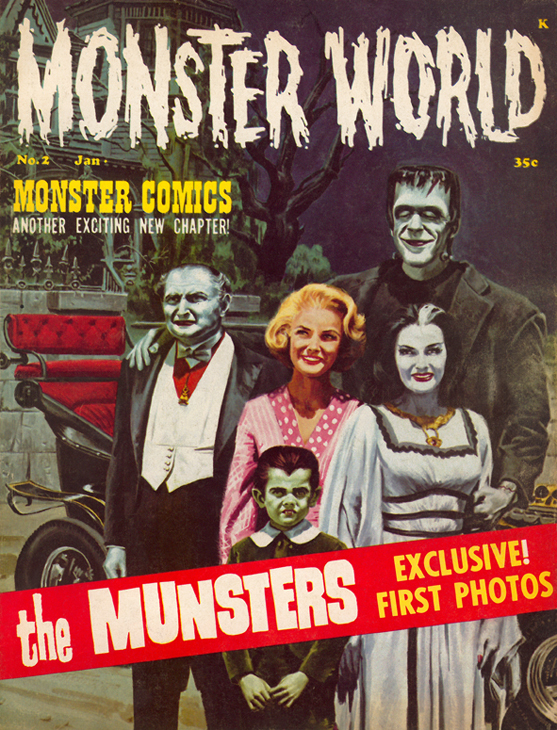 The Munsters were still brand new, having aired but a handful of episodes when they were featured on the cover of Monster World, the companion/clone magazine to Famous Monsters of Filmland. This issue, published in November 1964, with a cover date of January 1965, marks The Munsters first appearance on a national magazine. The realistic art, a straight copy of a cast photograph, is by the prolific Vic Prezio who painted uncountable covers for paperbacks and men’s adventure magazines. He stepped in when Basil Gogos went on hiatus as Famous Monsters’ defacto cover artist, producing portraits of movie monsters that were perfectly serviceable, but lacked the pizzazz that distinguished Gogos’ art. Prezio was infinitely more inspired when he painted covers for Warren’s comic magazines Eerie and Creepy. 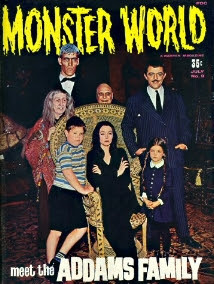 The Munsters’ competitors, The Addams Family, eventually rated their own group portrait cover on Monster World number 9, in July 1966. It was the next to last issue of the magazine, soon to be absorbed by Famous Monsters. The use of a color photograph instead of a more expensive painted job suggests a cost-cutting measure that telegraphed the imminent end of the short-lived title. I posted previously about Monster World. A complete gallery of Monster World covers.